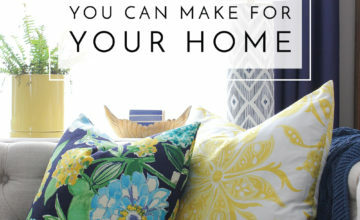 I am a DIYer at heart, and that isn’t more true than when it comes to sewing projects. As most of you long-time readers know, I am a self-taught, never-follow-patterns, trial-and-error kind of sewer. I often get a vision in my head…and since I understand the basic premise of how things come together…I’m able to figure out how to bring my vision to life. Sure I often have to consult my sister for advice and every now and then will You Tube a technique, but I really do enjoy the process of creating things on my own and figuring it out along the way. That said, over the years of making things for my home, there have been a few skills that I’ve attempted to figure out myself and was always disappointed with the results. Then, when I finally learned the “proper way” to do it, it felt like a true lightbulb moment! 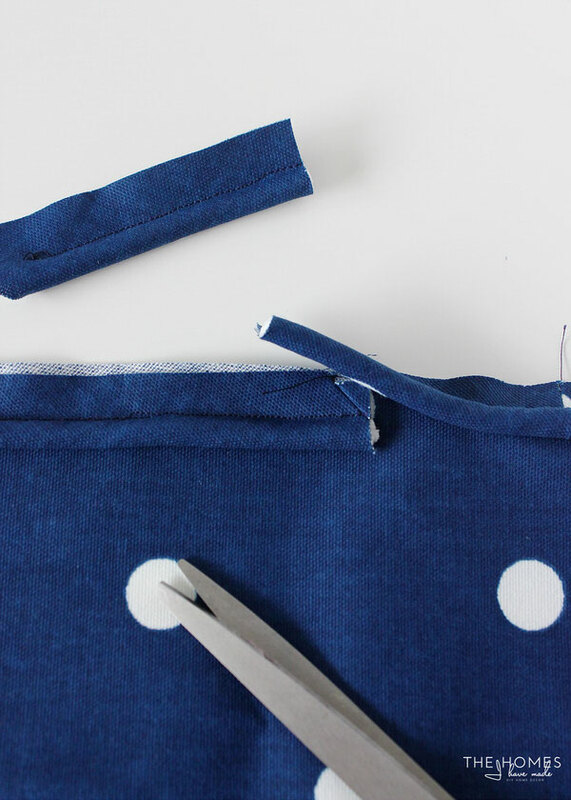 Yes, there is certainly merit in figuring things out yourself, but learning to do certain sewing skills properly often saves time and headaches, and ultimately makes your projects look SO much better! 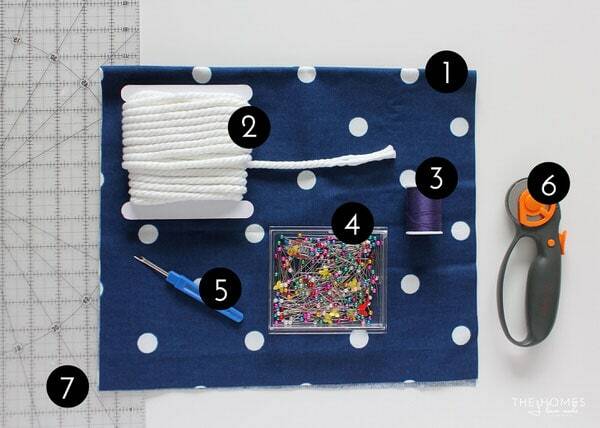 Today I am launching a new series I’m calling “Home Decor Sewing School”! 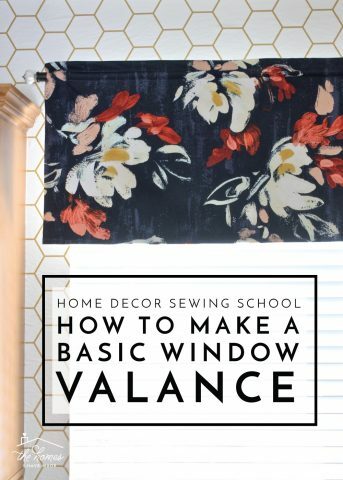 Each month I will break down one skill I use over and over in making unique items for our home; and if you want to make things for your home that look quality and professional, you should master them too! 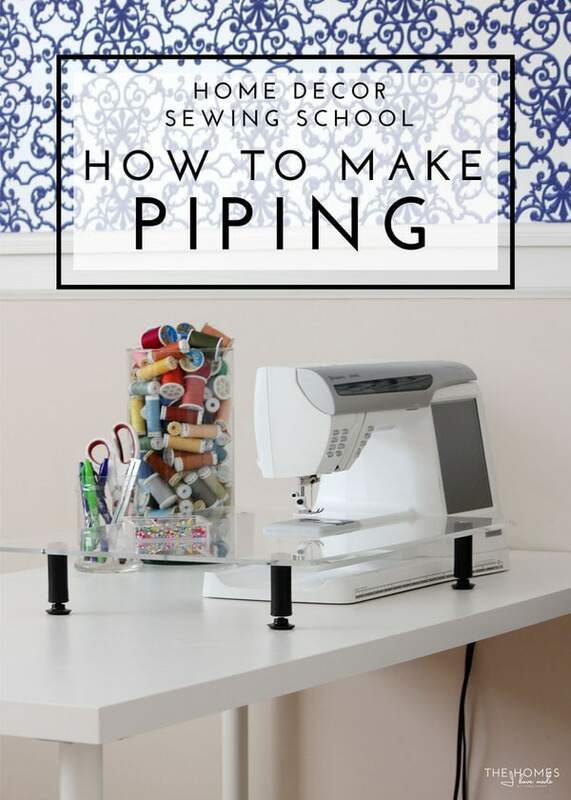 The first skill I’m going to teach is how to make piping for your home decor projects! 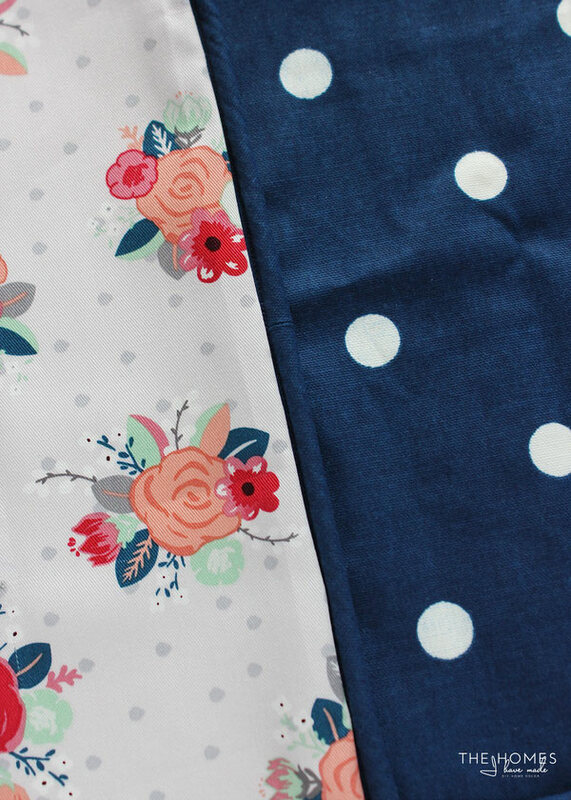 Fabric that coordinates with your project – how many yards will depend on how much piping you need for your project. A single yard of fabric can yield yards and yards and yards of piping, so I recommend starting there and then making more if you need it! 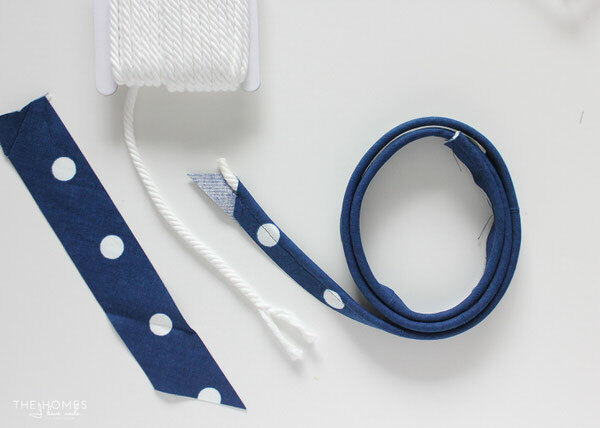 Cording – again, how much you need with depend on many yards of piping you need for your project. See below for a bit more on the “girth” of the cording. 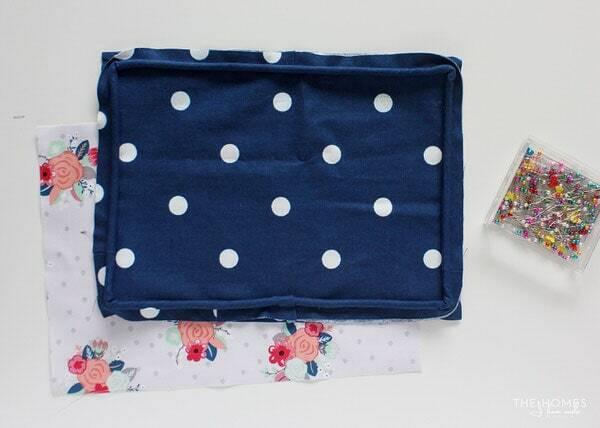 Start with your fabric flat on your work surface. It doesn’t matter if your fabric is right or wrong side up. Take one corner (it doesn’t matter which one, but I will demonstrate with the top right corner), and bring it to the opposite edge, creating a right triangle as shown (below, top photo). 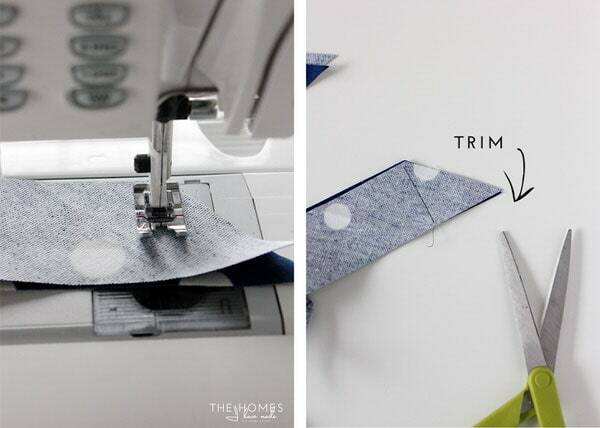 Using a ruler and rotary cutter, trim away the excess fabric not part of the right triangle (below, bottom photo). 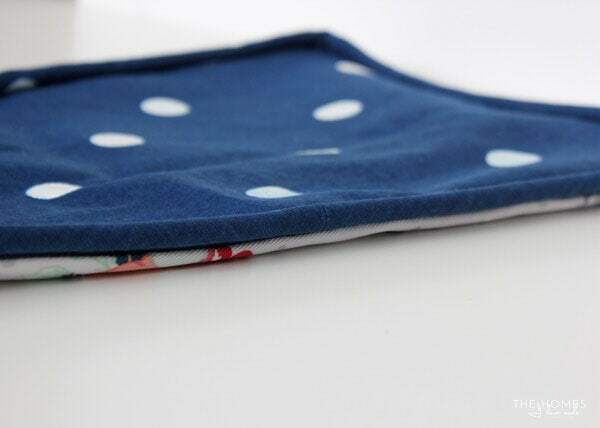 You can set this extra fabric aside and use it to make more piping if necessary. For now, we are going to focus on the right triangle. 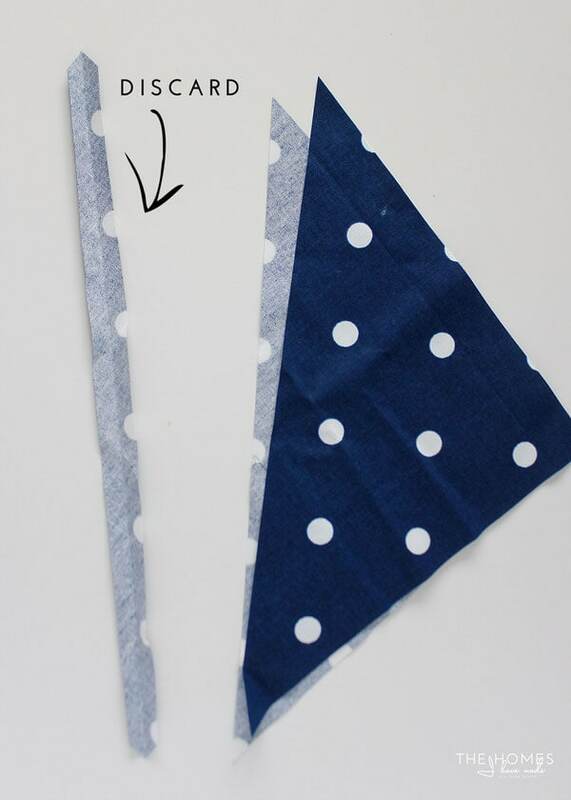 The right triangle should have two layers of fabric since you folded it down over the length of fabric. The next step is to cut the two layers apart. 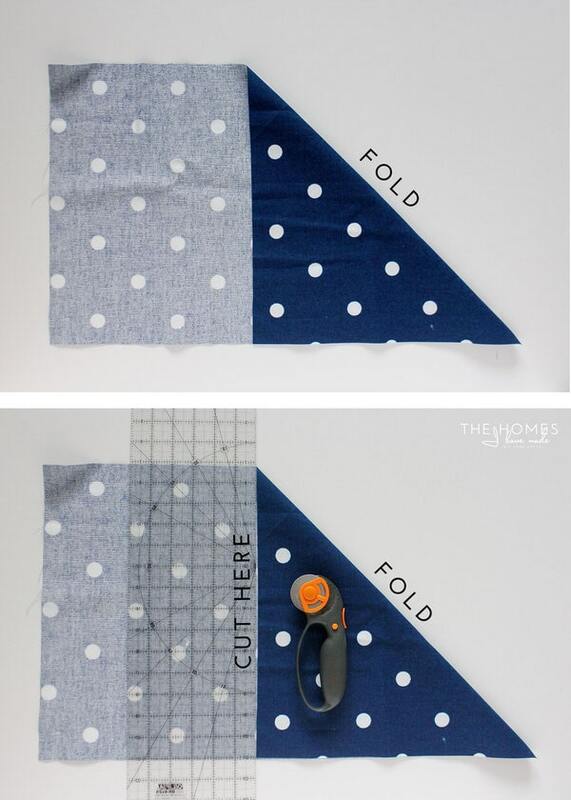 You can use a scissors to just cut down the fold. I like to use my ruler and rotary cutter to trim away 1/2″ so I am sure to have a clean, straight edge to start. 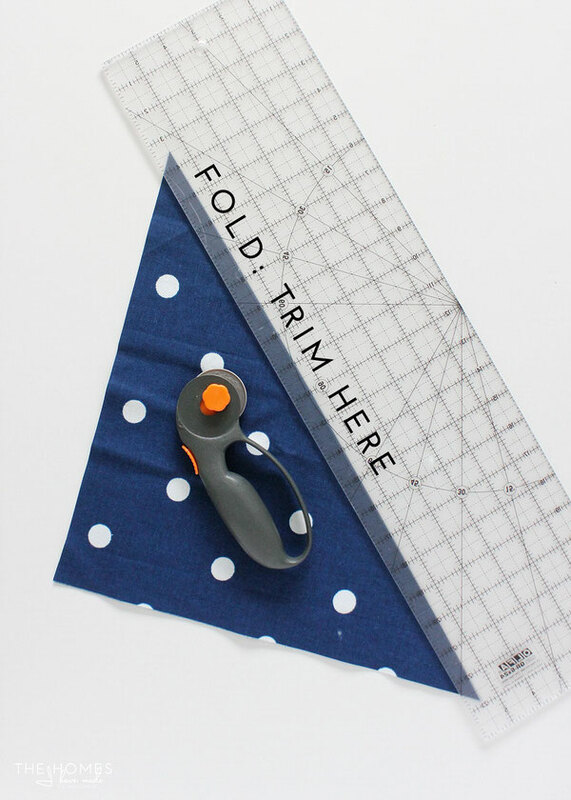 You can discard the 1/2″ strip you just cut away, and you should be left with two right triangles of fabric stacked on top of each other. I split the triangles apart so you could see the two layers. Line up those two triangles on top of each other before proceeding. With your two right triangles stacked, you are going to cut strips along that long edge (the hypotenuse) you just trimmed down. For the 9/32th cording, I like cutting 2″ strips. This width allows me to full wrap the cord and have plenty of seam allowance for sewing the piping into my projects. Simply cut two inches, slide your ruler over, cut two inches again, slide your ruler over, etc. Keep cutting until you get to the end of the triangle. Discard the scraps at the end. Because the two triangles were stacked, you should end up with double the amount of strips, all cut on the bias! See…not to hard, right? The next step is to sew all those strips together into one long strip. 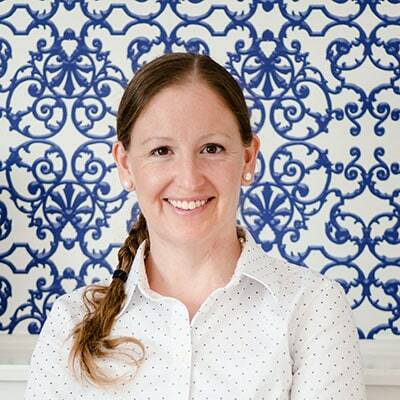 Okay – full disclosure here! There is the “correct” way to do this, and the “easier” way to do this. To keep all your strips perfectly on the bias and able to bend around curves on your projects, you should technically overlap your strips at a 90 degree angle as shown below. However, I tend to get lazy when I’m making yards and yards of piping, and I often just stack them together. I’ve never had issues with my piping not bending nicely around my projects, but I also don’t do a lot of small, tight projects. If you are working on something with small, tight curves, I definitely recommend doing it the “correct” way. 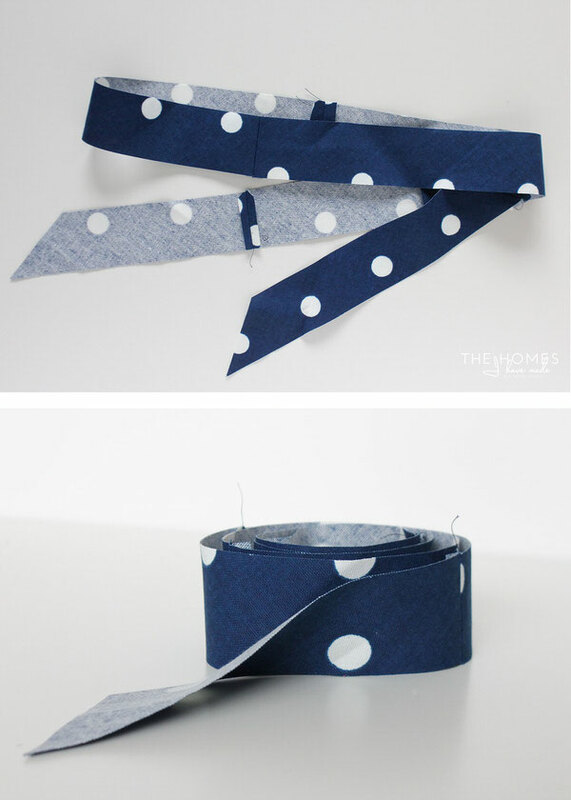 No matter how you choose to stack your strips, make sure they are right sides together and you sew them with a 1/2″ or more seam allowance. 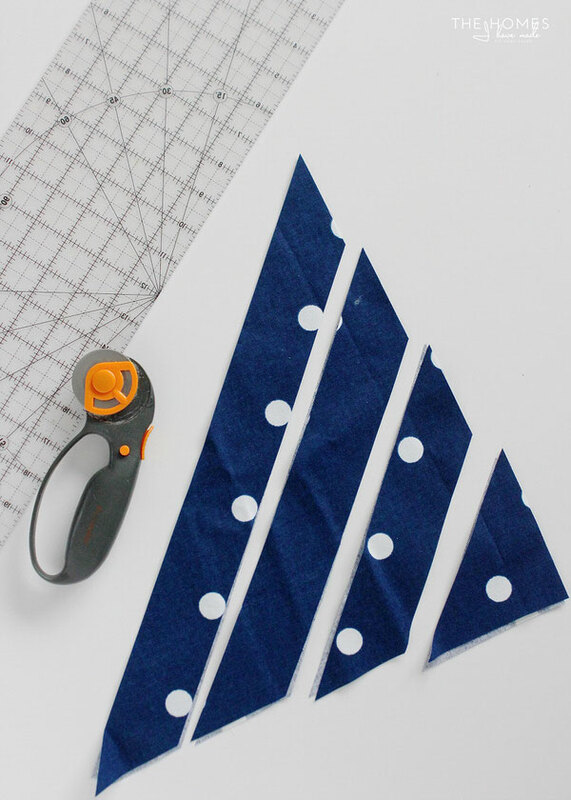 If you choose to stack your fabric strips like I do, be sure to trim away the extra triangle at the end to reduce bulk once the piping is assembled! 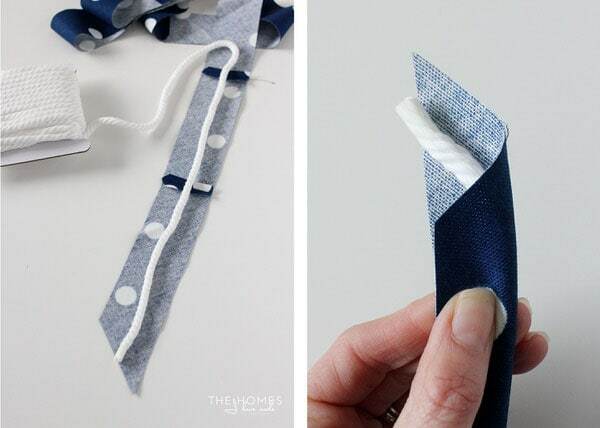 Continue sewing all your strips together into one long strip. 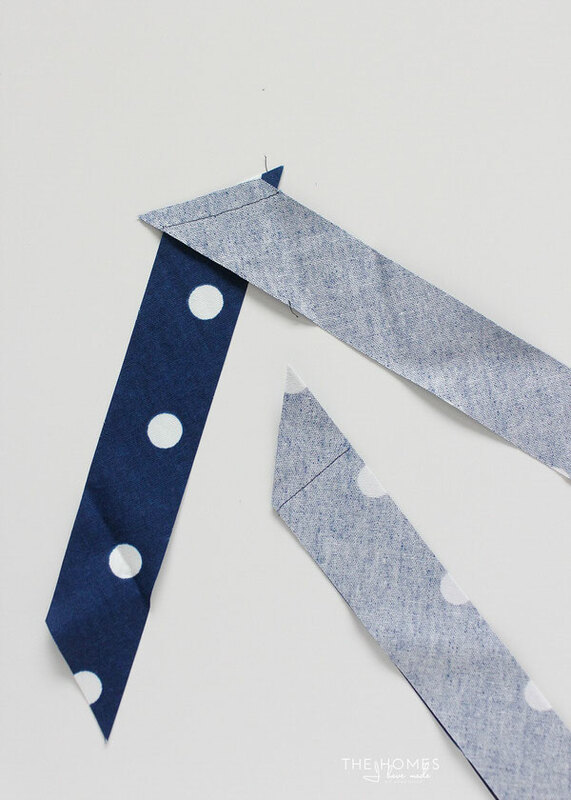 Once all your strips are sewn together, press your seams flat. Here is an example of how your seams should look once sewn, trimmed and pressed! I suggest sewing as many strips together to total the amount of yardage you need for your project. Yes, you can always make more piping, but it’s easier to add length at this stage rather than when the cording is all sewn together. 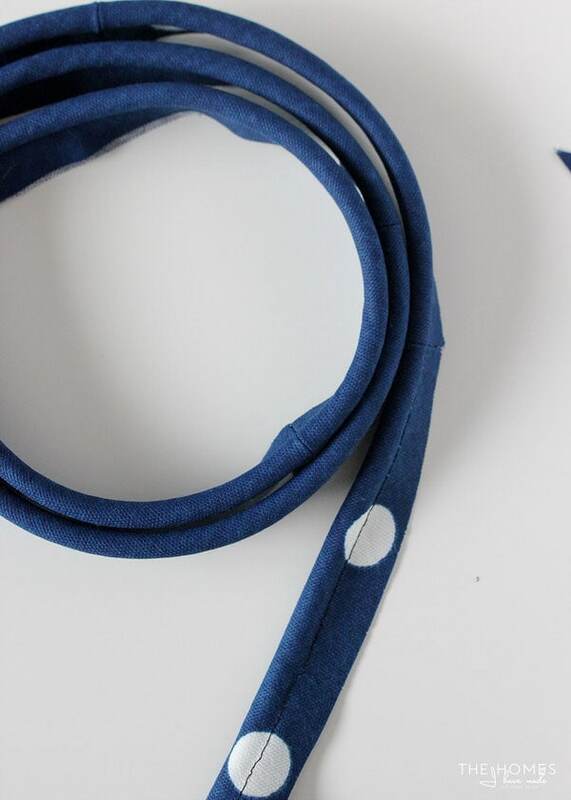 The next step is to add the cording to your long fabric strip to turn it into cording you can actually apply to your projects! 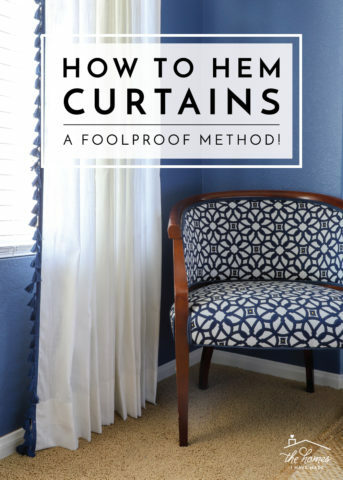 With the wrong side of your fabric facing up, place your cording down the length of it. Be sure the excess cording and excess fabric are both heading in the same direction. Then, fold over the fabric so that the raw edges meet, and use your fingers to push the cording all the way into the fabric. If you are new at making piping, I strongly suggest pinning the cording and fabric in place. Yes, it takes quite a bit of time (especially if you’re making yards and yards! ), but it makes feeding it into your machine much easier. I’ve made so much piping over the years that I am pretty comfortable feeding the fabric and cording into my machine without pinning…which admittedly saves a ton of time! Okay! 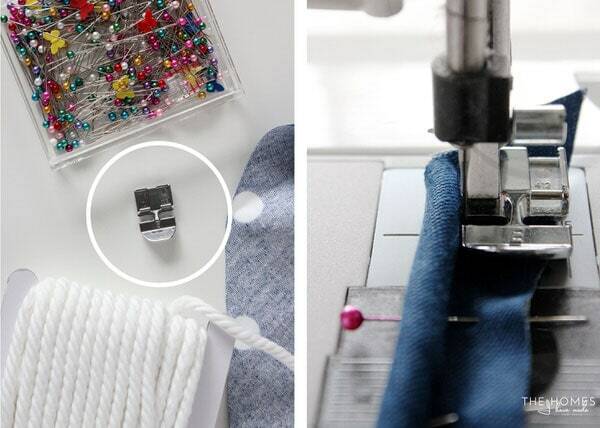 If there is one “secret” to successfully making and inserting piping, it’s this: a ZIPPER FOOT. This is probably common knowledge to those of you who were taught to sew properly, but when I learned to use a zipper foot with my piping, the whole process because SO much easier. A zipper foot allows you to get up right next to the piping, making for tight piping and smooth seams! So…dig out your zipper foot and learn how to put in on your machine. 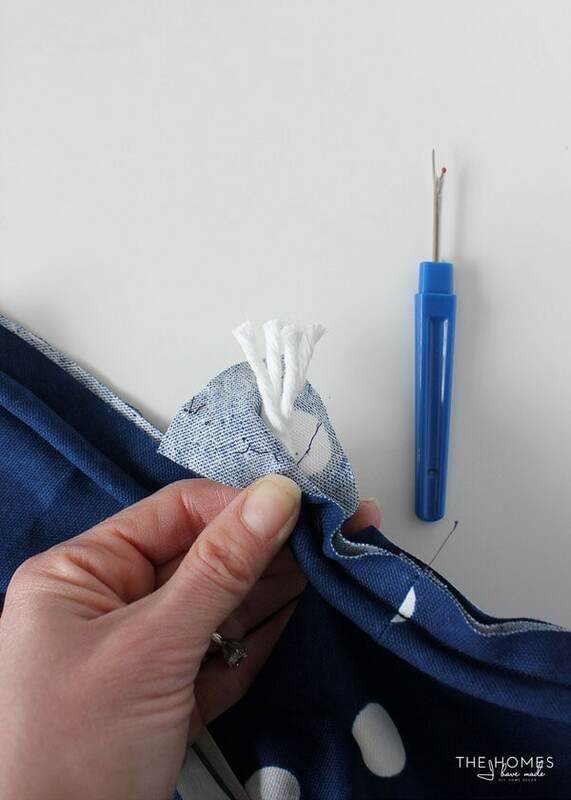 Once you’ve done that, sew down the length of your piping as close to the cording as you can get without sewing onto it! Tip: You may need to move your needle over to get as close as possible. After you’ve gone down the entire length of your fabric strip, your piping is done and ready to be applied to your project! Now that your piping is all made, you can add it to your project! 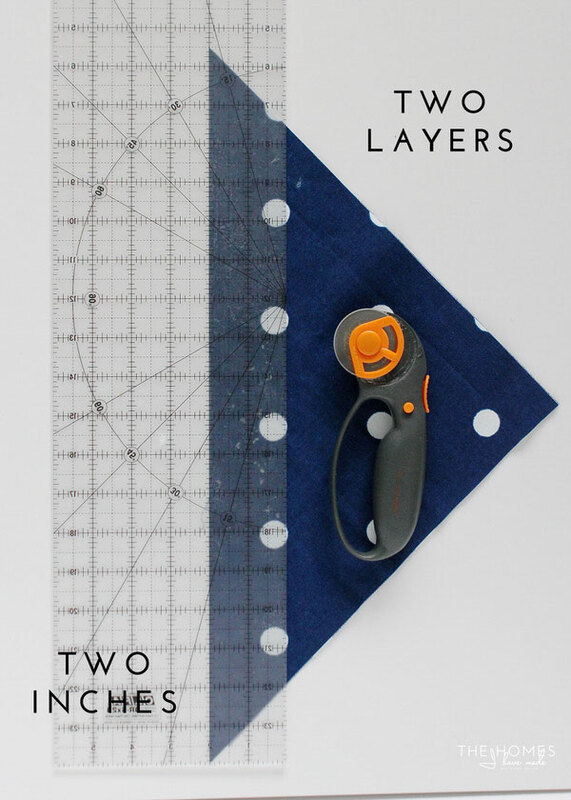 While this process might not be universally applicable, in my experience, piping goes into most projects the same way: sandwiched between two pieces of fabric. 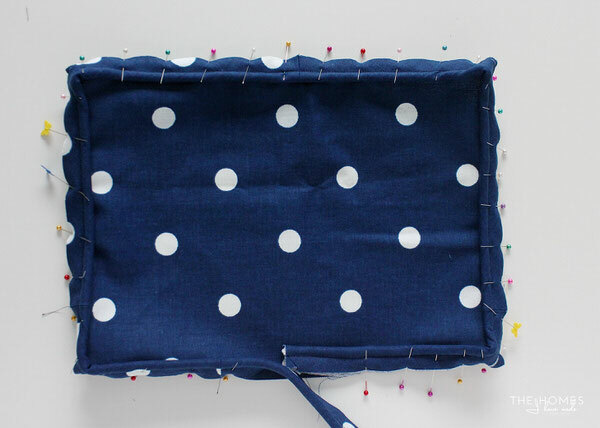 Start by placing one of your fabric pieces (doesn’t matter which one) right side up on your work surface. 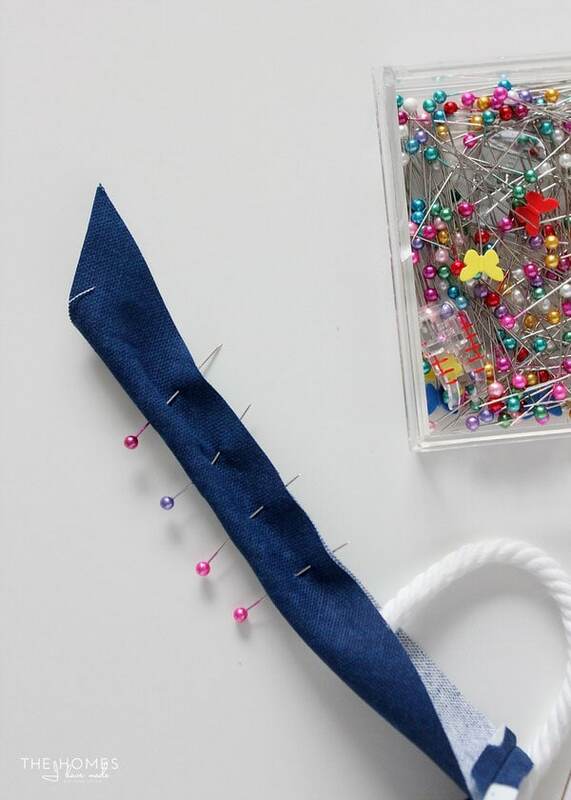 Using lots and lots of pins, pin your piping to the fabric by lining up the raw edges of both the piping and your fabric. 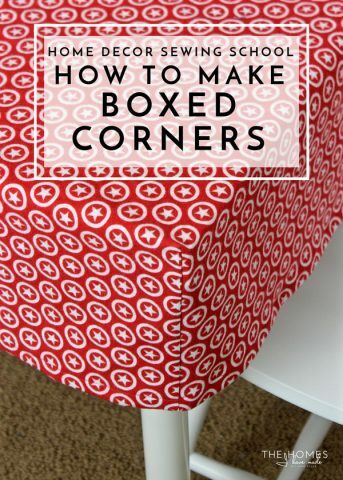 Don’t hesitate to use extra pins around the corners to keep everything lined up just right. 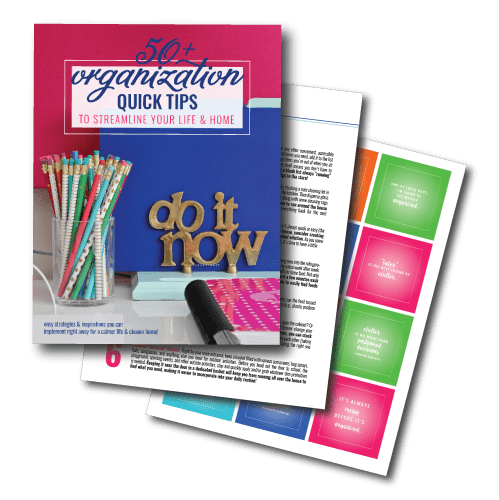 Work around your entire project with a continuous stretch of piping. If you need to add more piping (because of the size of your project), refer to the “joining” steps below. 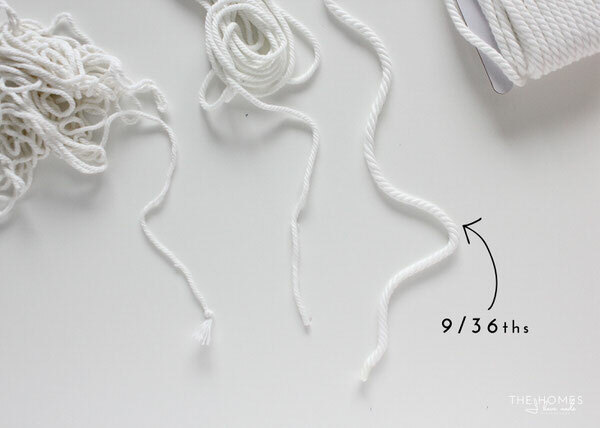 Once you’ve worked all-the-way-around your project, leave your two tails loose and unfinished for now. 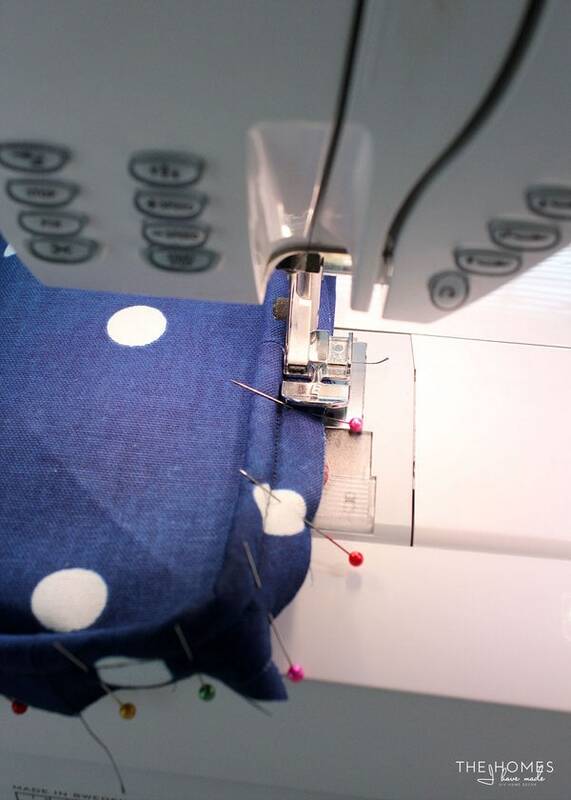 Again using your ZIPPER FOOT, attach your piping to the fabric by sewing RIGHT OVER the seam line on your piping. By following that initial seam (on your piping), you will be sure the fabric is up nice and tight against the piping detail. Here is how your project should look once the piping is sewn in place before finishing off the ends. 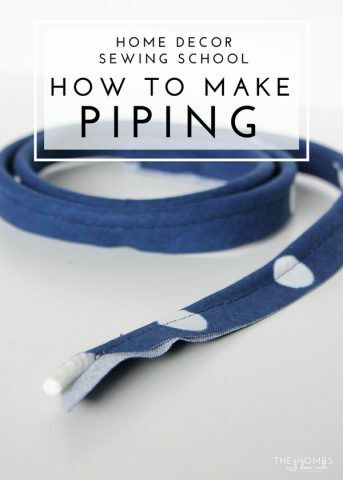 The process of joining two ends of piping is the trickiest part of using piping but is also one of the most important steps for clean-looking projects. For years, I would just drag my piping off the seam without properly joining it, which always left me with a weird bump/gap in piping. 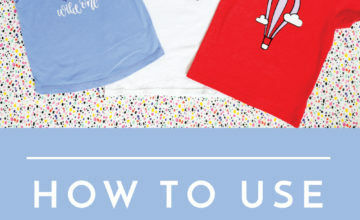 Take the time to learn how to do it now…I promise it’s not THAT tricky! Start by trimming off any excess piping, leaving about 1-2″ loose on both sides. 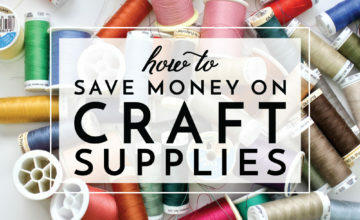 So that you have a continuos stretch of piping across your project without added bulk, you need to trim away some of the cording while leaving the fabric in place. 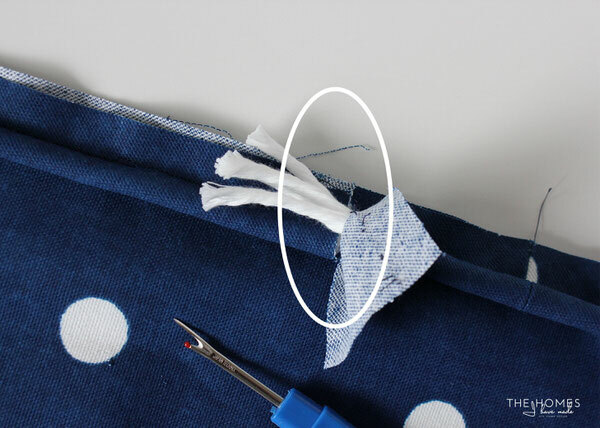 To do this, use a seam ripper to pull out a few stitches on the piping to expose the cording inside (only do this on one side). Using the other side piping for reference, trim away enough cording so that the two sides meet in the middle perfectly. Then slide the un-cut piping into the fabric space where you just cut away the cording. Fold the fabric down over the raw piping edge and pin in place. Use your zipper foot to top stitch the two ends of piping in place, again hugging the cording as tight as you can. As I mentioned, piping is most often sandwiched between two pieces of fabric. 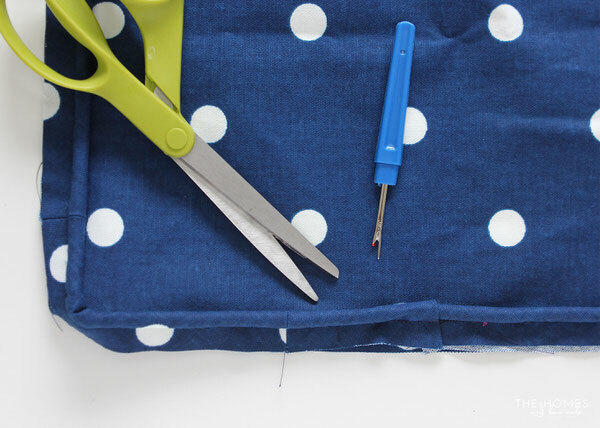 However, adding that second piece of fabric to your fabric+piping combo can sometimes be frustrating. 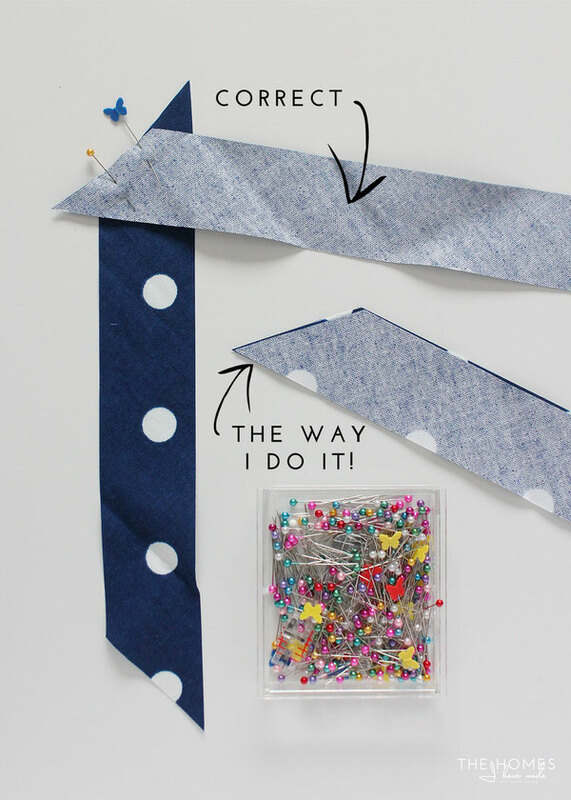 Over the years, I have perfected a method that makes sewing your entire project together easy and accurate! 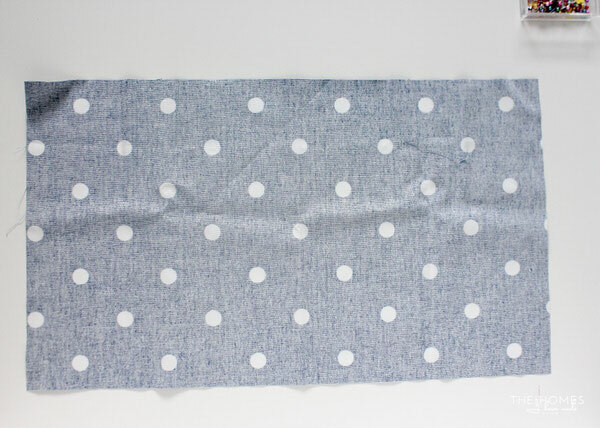 Here is the wrong side of my dotted fabric with the piping sewn onto it. Notice I used a pink bobbin thread so you could see the stitch line easily. As if I was going to make a pillow, I’m going to add another fabric onto the front of this fabric+piping panel. 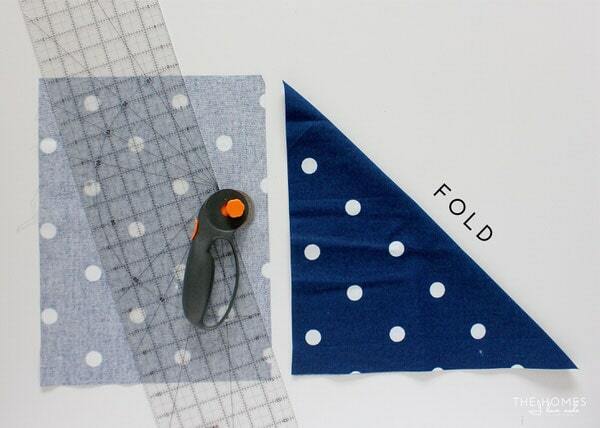 Put your two pieces of fabric together right sides together. When you pin, however, pin on the side that has the piping attached (in my case, the dotted fabric). 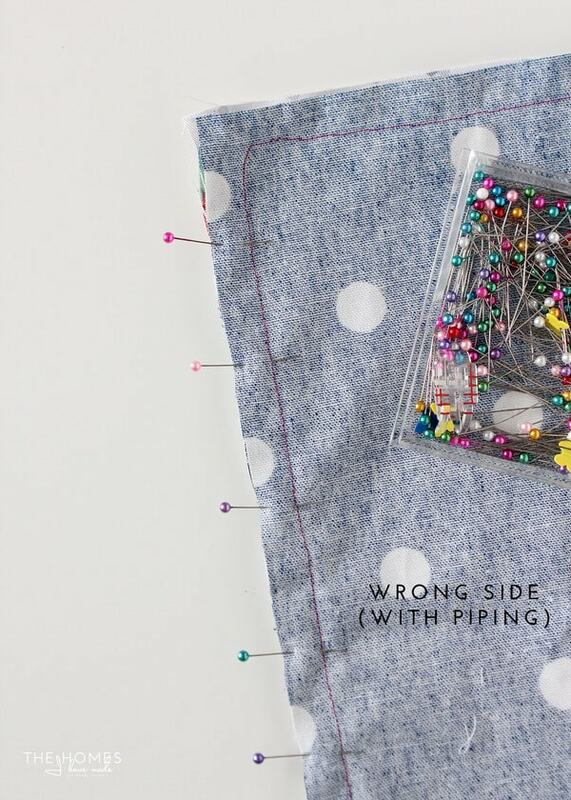 The reason I suggest you pin on the side with the piping attached, is that you now have a perfect line to follow when sewing your two pieces together!!!! Do you hear the angels singing? No? Just me? 😉 That pink line is the bottom thread from when I sewed the piping to the dotted fabric. 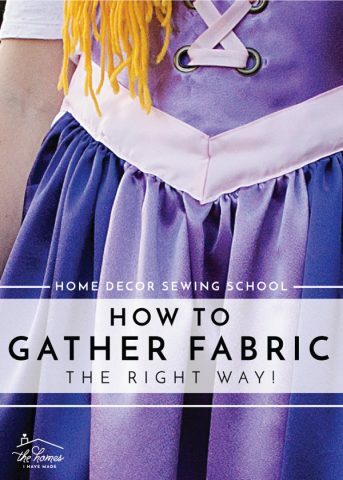 I already know that line is tight and right up against the piping, so by following it, I can be sure the second piece of fabric will also be sewn tight against the piping without crossing into the piping and catching it in your stitching! 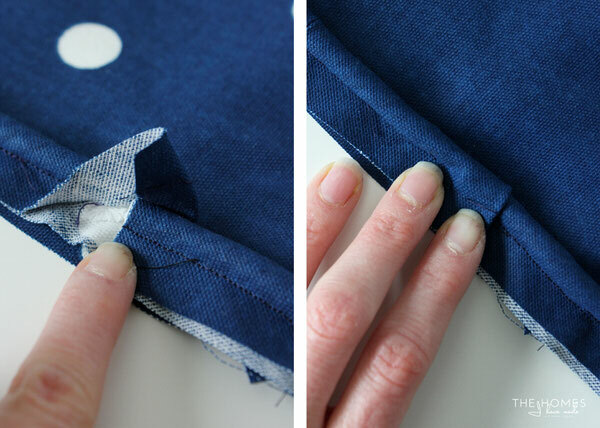 Once sewn, when you flip it open, you should have piping perfectly sandwiched between your two layers of fabric! 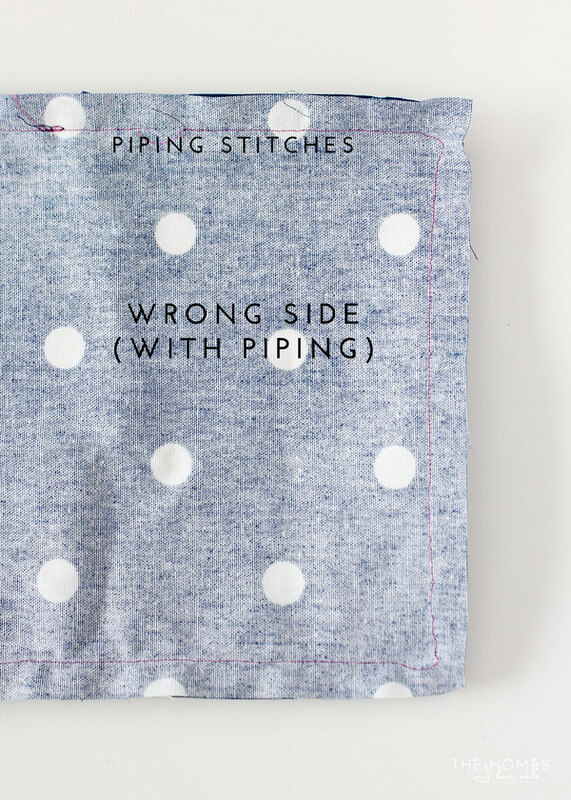 No pinching, no puckering, no stitches crossing over into your beautiful piping! Adding a custom piping detail to my sewing projects is one of my favorite ways to up the style factor in a lot of the things I make (and my secret to making them look less homemade!). It is an extra step that takes a bit of time, but oh so worth it! I hope this tutorial gives you the push to try it…and with practice, you’ll be adding piping to all your projects without any trouble at all! 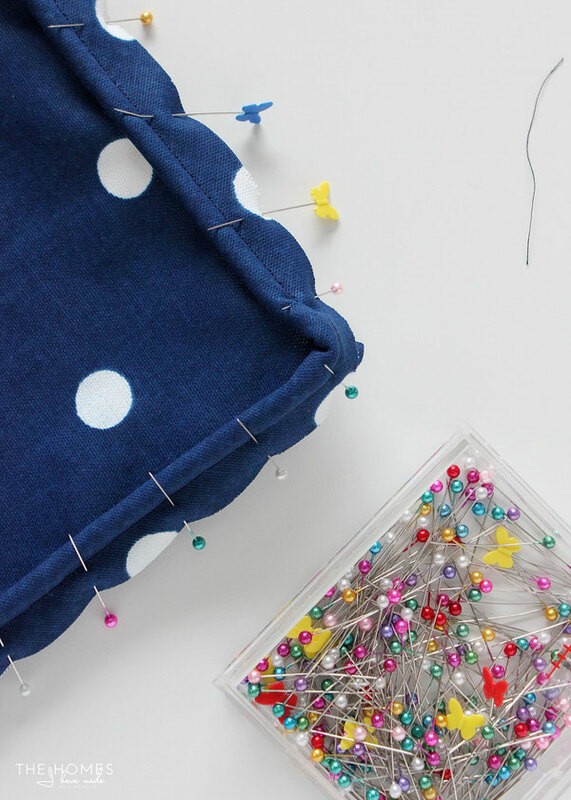 The Home Decor Sewing School series will be a monthly series and I already have a list of topics I’m hoping to tackle including how to add zippers to pillows, how to make boxed corners and more! If there is a skill you’d love a tutorial for, please let me know by leaving a comment below! I hope you are all having a great week! 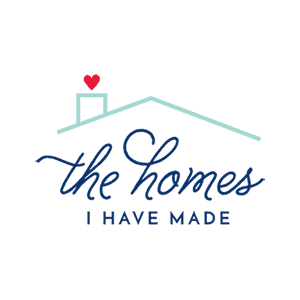 Be sure to come back on Saturday to see a new kitchen product I am really excited to share with you! Thanks for showing how you make piping. I have always been afraid to attempt it but now I know I can do it. I think this series is going to be a winner! I am so pumped to hear everyone so excited about this series! I know it seems like a lot of steps, but once you get the hang of it, you’ll be adding piping to everything, lol! You can do it! Thanks for stopping by and hope you’re having a great weekend! Thank you so much, Heather!! I’m so excited to hear that…I’m pretty pumped about it too! The more I make things, the more ideas I get for tutorials! I hope you guys will learn a lot and it will be good for me to brush up on some of these skills too! One fun thing I like to do with piping is use a super chunky cord when I’m doing kid projects (floor pillows, kid blankies). 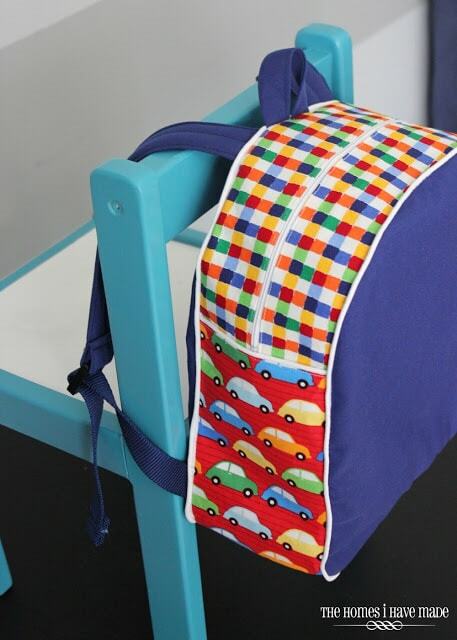 It gives a fun whimsical look to children’s items. Thank you for your detailed explanation and great pictures. So easy to understand and follow! Appreciate all the time you put into this. Looking forward to more in this series. It may encourage me to dust off my sewing machine. Thanks for the tutorial! 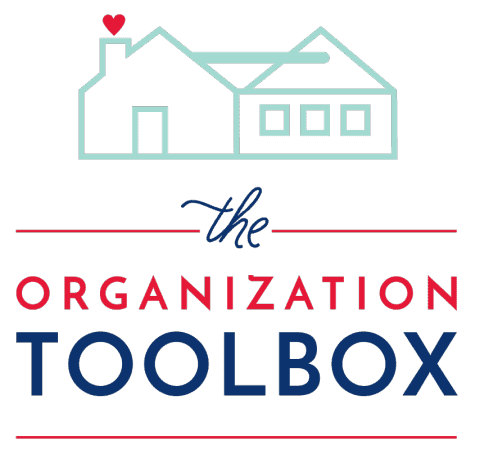 I found you blog by linking from I (heart) Organizing. 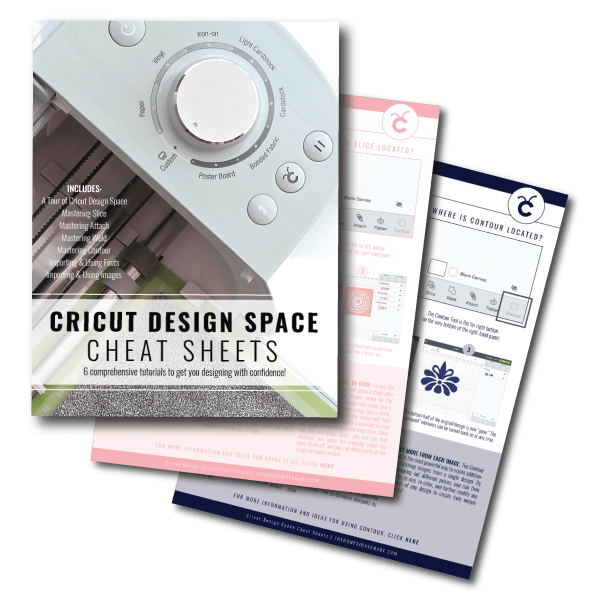 I have a question about how to measure for things that need to be a very specific size, but I’m not sure if I can ask it in a way that makes sense. Is there a formula or something to know what size seam allowance you will end up with depending on the piping size you are using and how wide you cut your bias strips? For instance, if I needed a piece to finish at 25″x25″ (say for the top part of an ottoman cover) and am using 9/32 cording and 2″ strips of fabric. How do I know how much more to cut the 25×25 piece? That is such a great question…and one I should have covered! 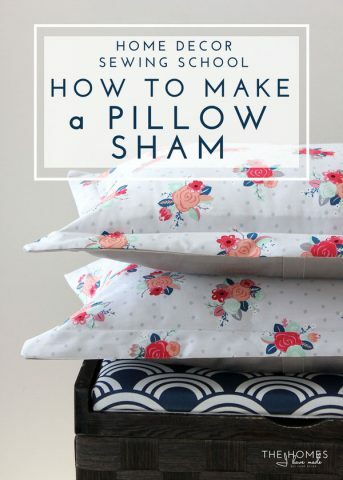 In general, you add in ” 2 x your seam allowance ” to your cuts. 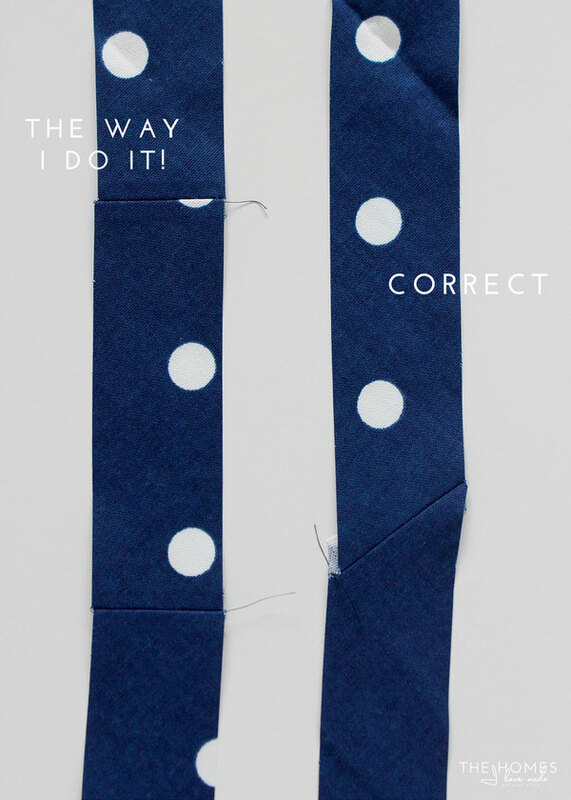 So if you are using a 1/2″ seam allowance (pretty standard), you add 1″ to your dimensions (1.2″ for each side). One thing I like about cutting 2″ for the cording, is that width leaves pretty much a 1/2″ of fabric once it’s all sewn together. 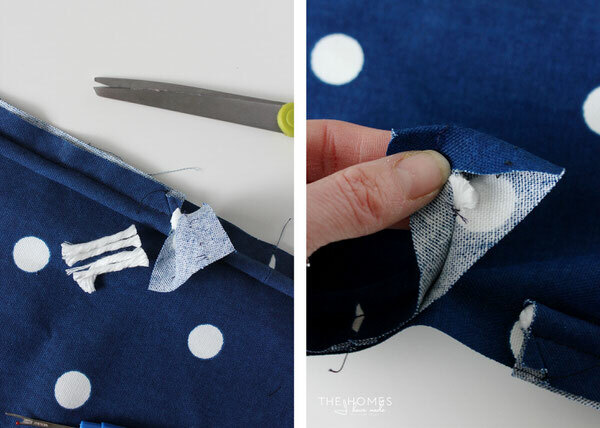 If you align your raw edges and sew on the piping seam as I demonstrated, you should end up with a 1/2″ seam allowance on your fabric. 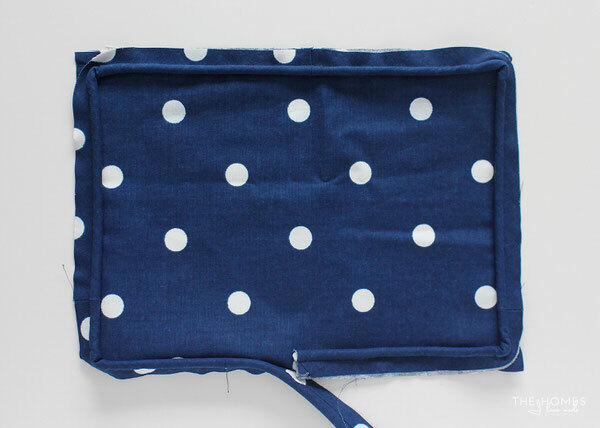 So…if I needed a 25″x25″ finished square with piping, I would cut a 26″x26″ square and then line up my raw edges with the piping and sew along the piping stitching (which should be about 1/2″ in). Does that help? So glad you popped over from I Heart Organizing to say hi! Let me know if you have any other questions! Thank you for that awesome tutorial, Megan! You did an amazing job! So I have been sewing for most of my life. My mom started me sewing at age 5. 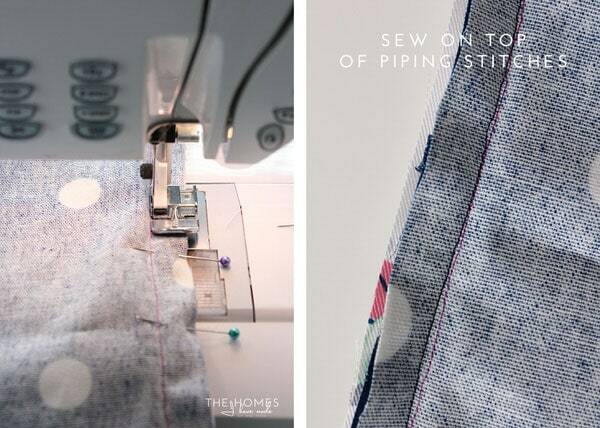 And sad to say, piping is not something I have ever thought about making let alone trying on a project. I do love this series. Such a practical series. 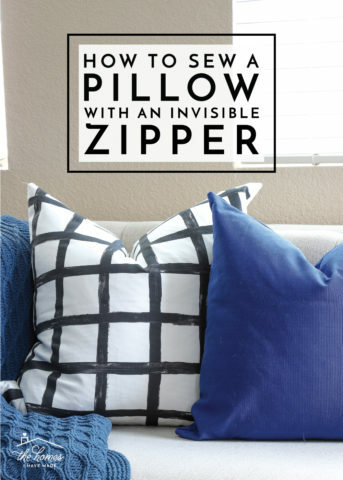 Piping, invisible zips in pillows, even a simple quilt. (I tell myself every year, this will be the year I try to quilt. And then I don’t.) I really can’t wait to see what else you have in store for us! 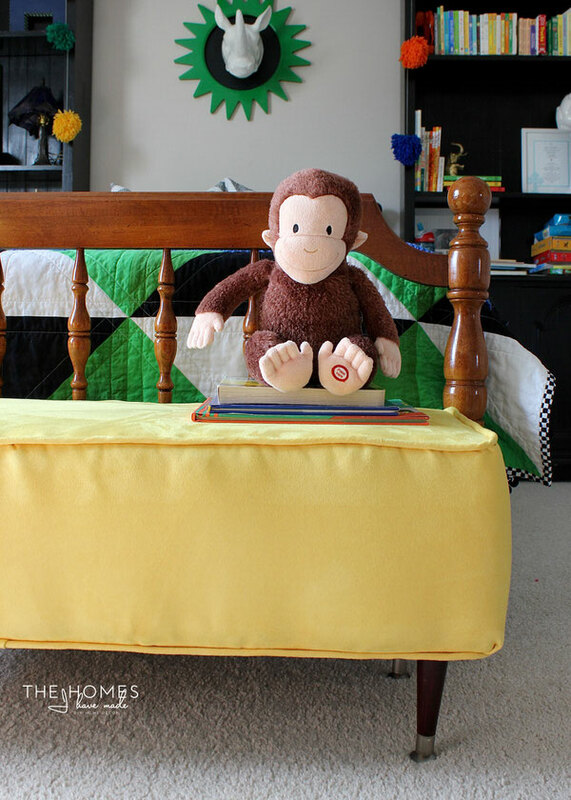 A simple quilt is a GREAT project to add to the list! I just learned the easiest and most fun technique and I think you all would love it! Thanks for the suggestion and hope you’re having a great weekend! What a super helpful series, Megan! I’m definitely pinning this one to try out on my next project. I know how to sew a straight line, but that’s about the extent of my sewing skills. I do own a machine, so I ought to master some of the basics. Thanks for the super detailed tutorial. Great series. I am really looking forward to more information! Megan, Thank you for the clear and concise instructional photos! I have done this before, but I definitely needed the re-fresher. I’m glad to have found you. 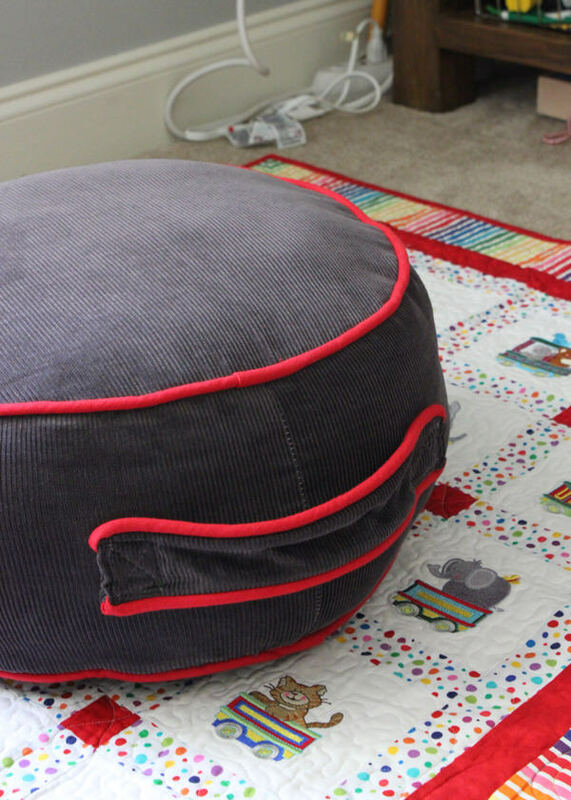 Is there any chance you could tackle and teach us to insert a zipper into a boxed cushion? It seems like a natural progression from this tutorial. I am so glad you found this tutorial helpful! 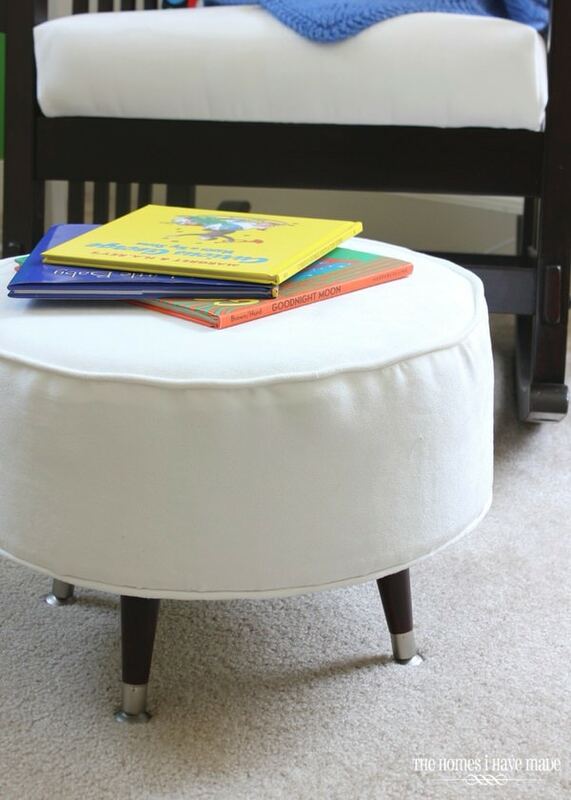 Yes, I will try to work on how to add a zipper to a boxed cushion in the coming months! Thanks for the request! 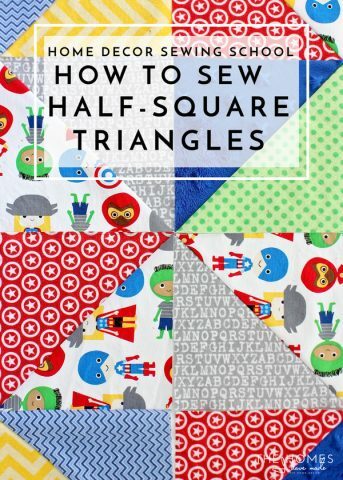 I would suggest that instead of cutting a square and having many small pieces to sew together, that you fold the fabric down at an angle as shown, finger press the fold, unfold and use the line to make the first cut. 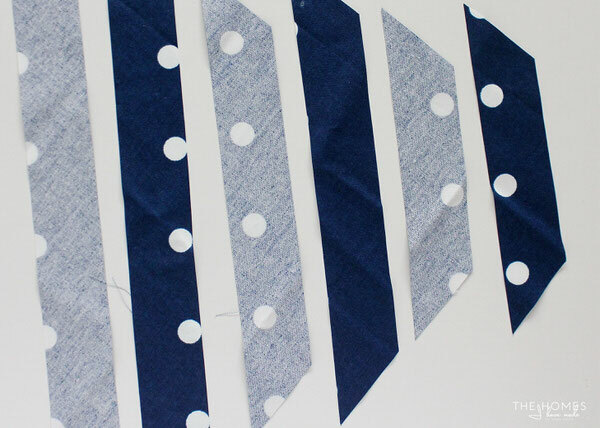 Then continue cutting 2″ strips along the length of the fabric.